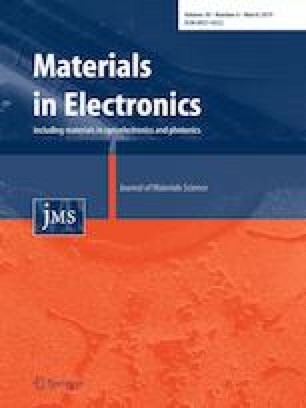 In this study, the Au/n-Si structures with and without (CoSO4–PVP) organic interlayer were fabricated on the same n-Si wafer and electrical characteristics of them were analyzed by using current, capacitance, and conductance measurements in forward and reverse bias voltages and experimental results were compared with each other. The values of ideality factory (n), zero-bias barrier height (ΦBo), and the rectifying ratio (RR at ± 3 V) for Au/n-Si and Au/(CoSO4–PVP)/n-Si structures were found as 2.453, 0.732 eV, 2.01 × 103 and 2.489, 0.799, 5.37 × 104 by using the I–V measurements, respectively. The RR of Au/(CoSO4–PVP)/n-Si structures at ± 3 V was 26.77 times higher than Au/n-Si structure. The concentration of donor-atoms (ND), Fermi energy (EF) and barrier height for these two structures were found as 15.06 × 1014 cm−3, 0.254 eV, 0.744 eV and 2.310 × 1014 cm−3, 0.303 eV, 1.010 eV from the C−2–V characteristics in the reverse bias region at 1 MHz in dark, respectively. These results show that the use of (CoSO4–PVP) polymer interface layer at Au/n-Si interface improves the performance of these structures. Additionally, a simple ultrasound-assisted method has been utilized to grown cobalt sulfide nanostructures. The morphological and structural analyses of them have been investigated by scanning electron-microscopy, and X-ray diffraction methods. This research was supported by Gazi University Scientific Research Project (GU-BAP) with 05/2018-10 and 06/2018-5 numbers.